The procurement of military equipment and related services in the system of Foreign Military Sales (FMS) might appear to be simple and convenient for those responsible for the maintenance of military equipment and specialized training at various levels of command due to the selective implementation of the Public Procurement Law of January 29, 2004. A lack of reflection in this area, however, may lead to violations of national and EU public procurement principles, ineffective spending of public funds, and a reduction of the logistic capacity and the level of training of the Polish Armed Forces and the potential of the Polish defense industry. In April 2003 Polish Government signed a contract with the U.S. Government for delivery of 48 multi-role aircraft F-16C / D Block 52+. The agreement was concluded under the Foreign Military Sales, a system of purchasing military equipment from or through the U.S. Government. In the case of the F-16s, Lockheed Martin Aeronautics form Fort Worth, Texas was the prime contractor. Purchasing in the FMS system of new military equipment that was used in the Polish Armed Forces was the right thing, and was based on the philosophy of Total Package Approach. This allowed for the purchase of not only the aircraft, but also the logistics and training package. Considering the complexity of this weapon system, this approach allowed for fast implementation of the F-16 weapon system to the Polish Armed Forces to an extent which made it possible to start training and operational use (e.g. air policing) at least at a basic level. In 2013, the Inspectorate of Armaments decided on the contracting of the next package of long-term agreements on maintenance of the Polish F-16s in the FMS system in all areas, including the delivery and repairs of parts (Follow-On Support). Support for the operation of F-16 aircraft in the FMS is a common practice in most countries operating the F-16, and may be a perfect complement to the service contract for the F-16, pursued currently by the Military Aviation Works No. 2 in Bydgoszcz, and securing supplies and repairs performed directly by tactical air bases within their own capabilities. Thus, the contracting of the next package of Follow-On Support agreements itself does not raise any issues in terms of their purpose. Still their conclusion may lead to some concerns. The package of Follow-On Support agreements was contracted after the amendment of the law of January 29, 2004 – Public Procurement Law (PPL), in force from February 20, 2013. If we assume that the FMS contract is a Government-to-Government (G2G) agreement and the Inspectorate of Armaments adopted as the starting point the provisions concerning the exclusion of the obligation to apply the Public Procurement Law in the case of contracting the supply of military equipment or sensitive equipment and related services by the Polish government from the government of another country (Law 1 point 4b. 6) this type of approach would pose in this particular case a risk of law violation. Using exemptions is in fact an exception, and according to the PPL, the contracting authority may not use the exemptions in the process of concluding contracts in the fields of defense and security in order to avoid application of the provisions of the law (Law 4b, paragraph 2). As it is universally known, the amendment to the Public Procurement Law was the result of the necessity of implementation of Defense Directive 2009/81 / EC to the Polish legal system. The provisions of the directive in the field of exemptions have been introduced to the PPL in the unchanged form. In order to present the intentions of the legislature and to standardize the interpretation of the exemptions in the EU member states, the European Commission issued a note Defense- and Security-specific Exclusions. It says that in terms of supply contracts, excluding the G2G agreements is generally designed for selling equipment which comes from existing resources or stock, such as used equipment or items, which are in surplus in relation to demand. This also applies if a member state buys new military equipment from the government of a third country, it must do so with due regard to its duty not to use such procurements in order to circumvent the provisions of the Directive. This is particularly important in situations where market conditions permit competition in the EU internal market. Public Procurement Law allows for a number of possibilities for contracts, including FMS agreements, from open tender to a single-source procurement. The starting point here is the correct description of the subject of the order and market analysis in terms of entities capable of realizing such orders (delivery, service). Maintenance of F-16 aircraft, or otherwise, further support of its operation (Follow-On Support) is a series of projects, such as parts supply, repair services, modifications, technical assistance for realization of which an outside vendor may be used in the domestic market (although so far within limited range) or within the EU, based on competition and the provisions of the Public Procurement Law. Still, there are resources of the U.S. government, which are necessary to acquire, and access to which is possible only in the FMS system, for example, international support programs (Technical Coordination Program, International Engine Management Program, Electronic Combat International Security Assistance Program, etc.). In these areas FMS agreements are fully justified, not only operationally, but also legally. In this situation, a single-source procurement may freely be used without the necessity to use exemptions, which, as stated in the Public Procurement Law and the Directive are the exception, not the rule. Also still noteworthy is the issue of the procedure of indicating the subcontractor (Sole-Source). So far, the signing of the FMS agreements for the maintenance of the Polish F-16 was associated with the use of the above procedure. It consisted in a written indication by authorized persons on the Polish side of commercial companies with which the U.S. Government drew the agreement on behalf of the Polish Government. The Sole Source procedure is one of the elements of the FMS described in detail in the U.S. legislation in this field. It has resulted in a lifting of the American side of the responsibility for the conditions of supply (i.e. price and delivery date), which may be more favorable for procurements executed in the competitive mode than those obtained from the selected subcontractors. After the amendment of the Public Procurement Law the application of this procedure is impossible because in practice it would grant single-source defense contract to a commercial company without considering the provisions of the PPL. In the area mentioned above the issues of implementation of any kind of training is particularly important. As described above, the explanatory note – Defense- and Security-specific Exclusions – gave an example of their proper application. To quote the note: “The government of Member State A may, for example, decide for operational reasons to conclude a contract with the government of Member State B on the training of its pilots by the air force of Member State B. Such a service contract would be covered by the exemption.” This is due to the fact that the purchasing government uses the organic resources of a government offering such training. Although this example refers to the member states, in this context the training of Polish F-16 pilots in the U.S. under the FMS agreement using U.S. government aircraft and military personnel or civilian employees from the Department of Defense, as well as training carried out by this staff in Poland (e.g. Mobile Training Team), being extremely expensive, they meet the criteria for the so-called ‘government – government’ (G2G) exemptions. Unacceptable from the point of view of the Public Procurement Law and the Directive is, however, using the FMS contract for hiring instructors who are employees of commercial companies to train Polish aviation personnel, contracted e.g. on the basis of the Sole Source procedure. Conclusion of contracts in FMS system requires from the customer not only an excellent knowledge of national and EU legislation, but also American regulations relating to the sale of military equipment (defense articles). Its absence may lead to violations of the principles of concluding contracts and to self-limitation regarding the ability of influencing the terms of such agreements. Currently organized training in the acquisition of military equipment, including by the Military Technical Academy, only a small percentage of time is committed to the topic of FMS. In-depth training for government personnel is offered abroad, for example, in the Defense Institute of Security Assistance Management (DISAM) at Wright-Patterson Air Force Base, Ohio. Using ‘government – government’ exemption when concluding FMS contracts for comprehensive maintenance of F-16 weapon system violates the provisions of the Public Procurement Law and the Defense Directive, since there is the possibility of obtaining the necessary external support on the domestic and the EU market. At the same time the U.S. government does not have the capabilities to provide comprehensive support for the operation of F-16 airplanes based on their own resources and it uses commercial entities for this purpose acting in this area only as an intermediary. 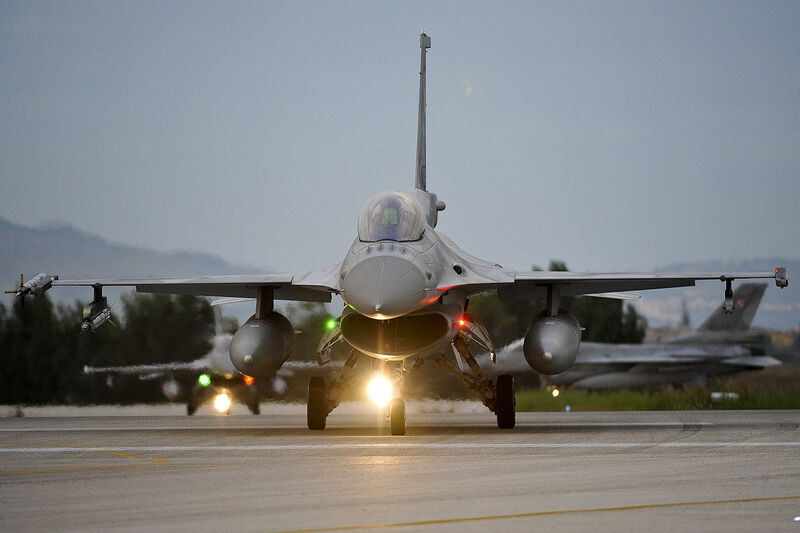 PPL provides sufficient legal tools that allow to conclude a package of agreements that guarantee support of F-16 aircraft operation in its full range of logistics and training, The principle being applied here states that wherever support may be obtained only through FMS (e.g. support programs), the agreements would be drawn on the basis of single-source with the U.S. government, and where support may be implemented by several entities (e.g. training, spare parts supply, repairs, modyfications, etc.) a competitive mode will be used, for example, a restricted tender. The Sole Source procedure in the FMS violates the provisions of the Public Procurement Law, and may lead to an unjustified increase in the cost of procurement of military equipment and related services (e.g. training).